Atlas Crane Service started in 1988 and has become the premier San Diego crane company. They have outstanding relationships with hundreds of H.V.A.C. companies throughout San Diego County and set a wide variety of equipment from condensing units to large chillers and cooling towers. They are known for being on time, dependable, helpful, efficient and have fair and competitive pricing. All of their crane operators are professional, courteous and licensed through the NCCCO as well as being certified riggers and just plain nice guys. They have worked hard to become San Diego’s first call for H.V.A.C. lifts and to earned the reputation of being “The H.V.A.C. Specialists”! The previous website was in dire need of being brought up to modern web standards. Remember the days when everyone and their brothers were making their own websites? Well Atlas Crane Service, being a family owned company, was no exception. They recognized the need to build a website that looked better, performed better, and presented their business as a professional company it was. There wasn’t anything salvageable from their previous site, so I had to rebuild the site from scratch. I leveraged the blue from the Atlas Crane Service logo and added red for accents. This basic site boasts a custom site structure, a layered slider on the home page, a custom image galley, and standardized contact forms with file upload capability, and is fully SEO ready. 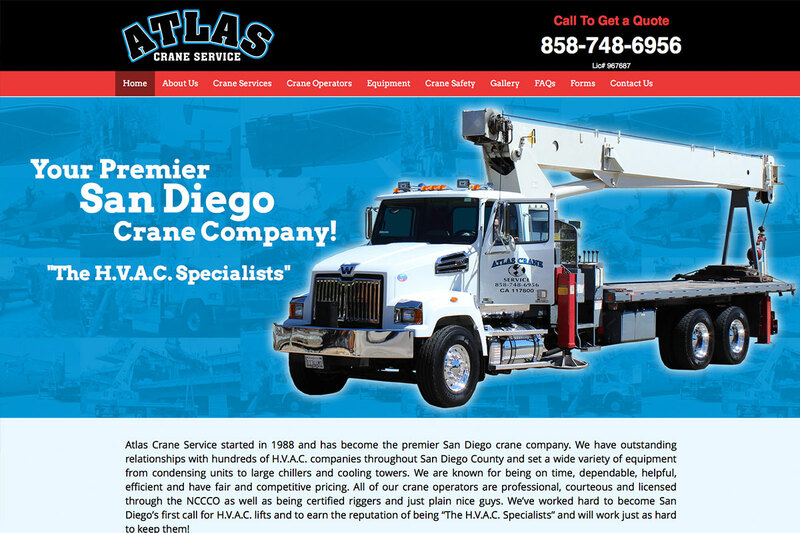 The Atlas Crane Service website is ranked # 1 and #2 in the San Diego for specific, highly competitive search keywords. Customers commented immediately their renewed pleasure working with a professionally built website. We are so glad we found Robert as he is a great and easy guy to work with. He uses some pretty incredible technology to share ideas and design possibilities to minimize time consuming meetings allowing you to run your business while he works out the details of the website construction. It started with a phone call and ended up with a website that fits and conveys the professionalism that we strive for in our company. We basically needed an “on line brochure” for our customers with access to forms and requests that could be filled out and submitted online to save us valuable time and recourses. We got that and so much more. I would recommend Robert without hesitation and he even came in UNDER the original estimate ( when does that ever happen?). If you’re looking for a website designer or help with your existing website, don’t hesitate to give him a call!